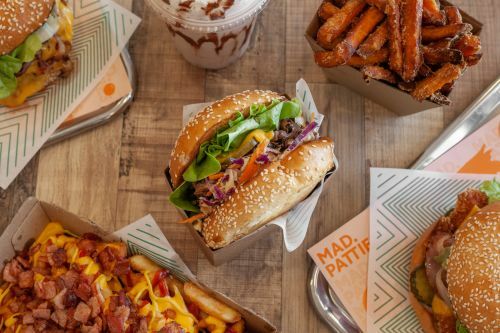 Mad Patties Mitcham uses their own specialised couriers to deliver their food. Beef, cheese, lettuce, tomato, ketchup and sweet mayo. Beef, cheese, lettuce, caramelised onion, pickles, jalapenos and hot MAD mayo. Rosemary infused potato patty, cheese, lettuce, tomato, jalapenos, tomato relish, sriracha mayo. Grilled marinated chicken, cheese, bacon, lettuce, avocado, onion and mustard aioli. Panko crumbed chicken, cheese, bacon, lettuce, pickles, caramelised onion and sweet mayo. Slow cook bulgogi pulled pork, cheese, lettuce, sesame seed, spring onion, coleslaw. Beetroot patty, cheese, beetroot slices, coriander, lettuce, tomato, avocado, basil pesto mayo. Pumpkin and chickpeas patties, cheese, lettuce, tomato, avocado, onion, tomato relish, basil pesto mayo. Roasted mushroom, cheese, lettuce, jalapenos, coleslaw, hot MAD mayo. Beef, cheese, bacon, pineapple, lettuce, tomato, egg, onion, ketchup and sweet mayo. Beef, panko crumbed chicken, 2 x cheese, pickles, jalapenos, sweet mayo. 2 x beef, 2 x cheese, 2 x maple glazed bacon, lettuce, caramelised onion and MAD mayo. Cheese sauce, spring onion, jalapenos, hot MAD mayo. Cheese sauce, bacon, mustard, ketchup . Avocado, bacon, sour cream, coriander. Pulled pork, spring onion, jalapenos, sesame seed, sriracha mayo. 10 x fried chicken wings, sweet hickory BBQ sauce, spring onion and sesame seed. 10 x fried chicken wings, house mixed chilli sauce, cut red chilli, spring onion and sesame seed. Mango, mango nectar, mango yogurt, milk, sorbet and ice. Mixed berries, banana, strawberry yogurt, milk, sorbet and ice. Banana, mango, mango yogurt, sorbet, milk, sorbet and ice. Mango nectar, mango sorbet, plain sorbet and ice. Oat, chia seed, avocado, banana, mixed berries, yogurt, honey and milk. Kale, celery, cucumber, apple and ginger. Orange, apple, watermelon, carrot and lemon. Pick up to 4 ingredients. 100% pure green tea matcha powder, ice cream and milk. Peanut butter, salted caramel, ice cream and milk. Oreo, ice cream and milk.